Audiolab shrinks its M-DAC to Mini size | What Hi-Fi? Audiolab's fêted range of standalone DACs gets bigger in a small way. There's a new addition to Audiolab's M-DAC family. 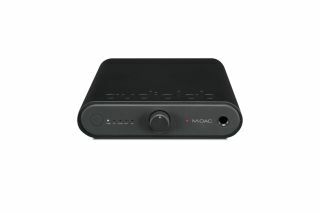 The M-DAC Mini is, as the name strongly suggests, the smallest and most affordable model in what is now a four-strong range. Following in the footsteps of the Award-winning M-DAC, range-topping M-DAC+ and M-ONE DAC/amp, the M-DAC Mini uses the ES9018 Sabre 32 Reference DAC to do the leg-work. Like the M-DAC+ it's ready to handle PCM audio date up to 32-bit/384kHz via USB, as well as DSD64, -128 and -256 through the same input. Despite its size, the M-DAC Mini squeezes in optical and coaxial inputs and outputs, USB type-A and mini-B (asynchronous with discrete master clocks), stereo RCA outputs and a 6.3mm headphone socket. Wireless connectivity is via aptX Bluetooth. M-DAC Mini is the first of the M-DAC family to include battery power - this obviously aids its portability, but equally significantly supplies clean, stable DC power. The Mini can also be mains-powered, and it can charge iOS devices whether it's using mains or battery power. The M-DAC Mini's full suite of functionality, handy dimensions and mixture of polypropylene and aluminium materials will set you back £300 when it goes on sale next month.